A special occasion centered around the enjoyment of the outdoors and to celebrate the fall harvest with friends; once again we gather to tantalize our taste buds with unique dishes — all cooked with wild game. Starting with a variety of appetizers, such as Pickled Dried Venison with Home-made Wine Cheese and Pickled Northern Pike served with Pineapple Infused Vodka. Leaving our guests guessing, we sampled (for some, their first time) Dove Pate and Pheasant White Chili. The main course was Bacon-Wrapped Venison Tenderloin served over Garlic Mash Potatoes and my own steak sauce, made from reduced stock and carmelized onions. 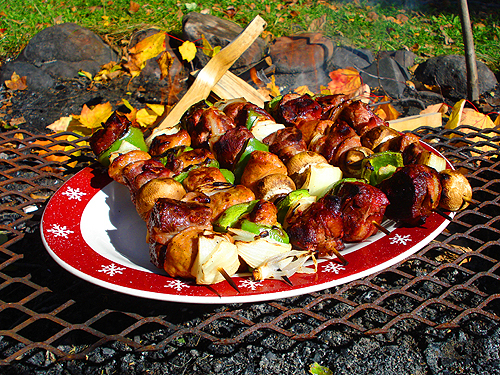 It only goes to show that….the Gods must have been hungry when they create wild game, because it sure is good!